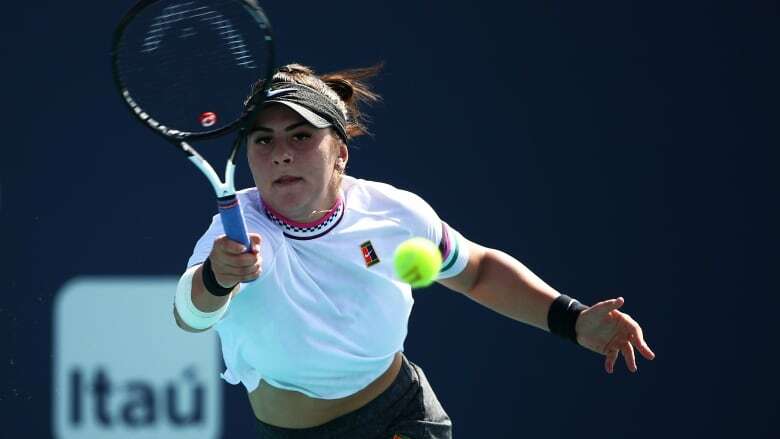 Canada's Bianca Andreescu has exacted revenge on one of the three women to beat her in the 2019 season, while Milos Raonic didn't have to hit a shot as both advanced to the third round of the Miami Open on Friday. Canada's BiancaAndreescu has exacted revenge on one of the three women to beat her in the 2019 season. The 18-year-old from Mississauga, Ont., won her ninth consecutive match on Friday, beating No. 32 seed Sofia Kenin of the United States 6-3, 6-3 in a second-round contest at the Miami Open. "I got a sense of how she plays. Obviously, I was expecting the right things," Andreescu said of the rematch with Kenin. "I definitely played a lot better than in Acapulco." Friday's match lacked the drama of Andreescu's previous three outings — all of which were three-set, two-plus-hour contests. She was coming off a thrilling win over Romania's Irina-Camelia Begu in which Andreescu trailed 6-3, 5-1. "I'm actually really happy with how my body's holding up. The only thing that's a problem is now my shoulder is pretty tight," said Andreescu, who had her right arm taped for Friday's match. "I've been seeking treatment. It's not too bad." Andreescu recorded another three breaks in the second set. Kenin double-faulted on the final point of the match, Andreescu's third match point. Andreescu said she's trying not to focus on her winning streak. "I try not to overthink about what happened last week. I know I just won a really big tournament, now I'm here in Miami," she said. "The only pressure I think is the pressure I put on myself." On the men's side in Miami, 18-year-old Felix Auger-Aliassime of Montreal also is heading to the third round. The No. 12 seed from Thornhill, Ont., won by walkover against Maximilian Marterer on Friday as the German retired before the second-round match.